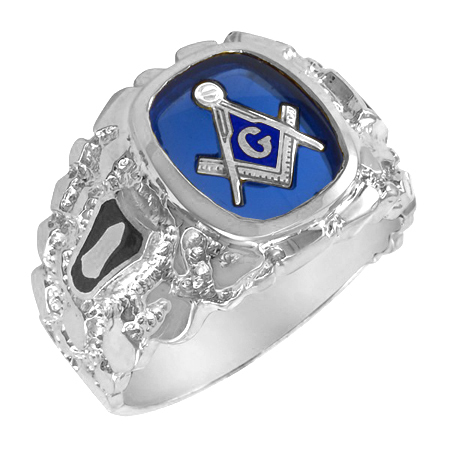 Open back, polished solid sterling silver masonic ring has a wide textured shank. Oblong blue synthetic stone is topped with a compass and set square symbol. Textured shank features blue enamel plumb bob and trowel side emblems. Item weighs approximately 9.1 grams. This item is handcrafted in the USA. Stunning! So Much Nicer Than Picture! Extraordinarily pleased with the looks and fit of this ring!!! So classic and refined, but sturdy at the same time. The picture was nice, but it does not do it justice! WOW! I love it and my husband loves it, too...Mark this day in history! It's wonderful to receive an order that is better than you envisioned it would be. Thanks!!! The product actually looks better than the photoghraph.